Articles and books on any aspect of improvement are notoriously difficult to write; they can easily appear condescending or unfairly critical or they can differ from the reader’s own opinion, causing offence and denting the ego, inciting anger. However, as a revolutionary movement with high ideals which seeks to draw in others of our folk, and as a religious movement that is not seen as mainstream yet whose members know that we must make a significant impact on our society if we are to achieve our high ideals, it should be viewed necessary to cast an occasional critical eye on ourselves – our attitude, our achievements and our ability to mobilise folk and resources to our best advantage. In the space of a few short decades, something strange has happened to our race, and as members of that race we should not be so arrogant as to presume we are not subject to the same influences and problems which affect others. Very few if any of us manage to live a ‘pure’ existence; however hard we try we all occasionally drink too much, eat poor food, spend too much time on a mobile telephone or sat at a computer. We are all bombarded with the same negative vibrations, either via radio masts or from the negative energy of others and so forth. The thing that makes us different as Odinists of the Odinic Rite is that we understand that to operate at our highest potential we must reduce to a minimum the negative aspects of life and increase the positive aspects; positive aspects including such mundane things as exercise, fresh air and good food through to the more esoteric aspects of our religion such as blotar and meditation. We should all understand that to be healthy we should eat and drink healthily and maintain some kind of exercise routine. That part of our daily life is obvious. Also, it should be fairly obvious that meditation brings great benefits, but it is down to each of us as individuals to find the time to partake in this activity. Likewise, attending group blots or blotting alone is an essential part of being an Odinist. When we hold blotar, it is so different from everyday normality that we are able to readjust our focus away from the mundane and for a short time we reconnect with the energies within and around us. If you happen to be new to the OR then try to make the effort to meet on occasion with a Hearth and you will see what I mean. All of the things mentioned in the last couple of paragraphs have been covered in previous issues of ORB and will be covered again in future. But what I want this article to focus on is the vast amount of time we spend when we are not exercising, when we are not meditating or holding blotar and when we are not eating good food, and how we can use this huge amount of time to maximise our potential as individuals and as a religious movement. Unless you are one of the very few people who have total mastery over your ‘inner voice’, the majority of your day will be spent listening to your own incredibly negative thoughts. That may sound like a strong statement, but if you consider this for a moment I feel certain that most if not all readers will agree that while at work or while alone and even while with friends, your ‘inner voice’ will be running a continuous, mostly negative, commentary all the way through the day. Some of you will suffer from this more than others, but that voice is always there and those of us with concerns about our land, people and heritage often suffer the most. My view and my proposal is this: If we are to bring about a New Awakening as a part of the world’s premier Odinist organisation, our individual day to day thoughts must be collected, disciplined and made to work for us rather than against us; our thoughts being somewhat akin to a scattered herd of sheep being pulled into order by a well trained dog. The British Army has a recruitment slogan that reads, ‘Forward As One’. We don’t each have on hand an immaculately dressed drill sergeant to break us down then build us back up, so we will have to be our own drill sergeant and recognise our own failings before beginning the rebuilding process. Fortunately as good Odinists with an ingrained determined attitude and a thirst for wholeness, we should all have strong foundations to work on. Let me take a quick break here and refer back to the first few words of this article. In no way am I trying to tell other OR members that I am a master of personal development. As with any of my articles and any of my ideas and initiatives, they always start as means to furthering my own development and are written down in order to help me to learn through my own experiences. So don’t follow my lead but please do take the journey alongside me. Now, in order to understand the path of self development, we must understand the concept of hypnosis. Firstly, all hypnosis is self hypnosis. Secondly, our inner voice is hypnotising us every day without us realising it. Thirdly, it’s up to you to consciously craft the results of your own hypnotherapy and ultimately decide whether you reach your full potential or not. For that is why we are here – to reach our maximum potential. It is generally thought that it takes about twenty-one days to break an ingrained habit though self hypnosis. For example, if your inner voice is always telling you that you’re afraid of pickled onions, it will take three weeks or so of regular, focussed positive affirmation exercises to reprogram your thought pattern. If, over the course of your life, you have let your inner voice go wild, you may find that you have a lot of issues to deal with and it may seem you will never cope with the challenge of life. But let me tell you now, if your inner voice can break you, then you can make your inner voice work for you and thus you can raise yourself up to wherever you want to be. And if every member of the Rite became motivated to achieve their highest personal ideals, consider how the OR would benefit if we then moved ‘Forward As One’. This exercise is an Odinist one. Our Gods and Goddesses want us to be like them whilst the monotheistic religions want their followers to grovel in the dirt. Ours is a pathway of achievement and light; theirs is a one way ticket to slavery. This is the very crux of my argument – do we want to be slaves to our own negativity or do we want freedom? In ‘Thus Spoke Zarathustra’, Friedrich Nietzsche asked, ‘Are you a man as ought to escape from a yoke?’ In essence he was asking if you have the moral fibre to cope with real freedom. Many do not and many wish for freedom but completely fold when the opportunity arises. Freedom is scary because the free man must support himself and rise to every challenge. Control over populations is relatively easy when this is understood, but in understanding this we are able to counteract it, and the struggle begins in first smashing our own negativities and having control over ourselves, which means controlling our inner voice. To begin with, try this ten minute exercise. Unlike meditation, you don’t need peace and quiet and you can do it at any point during the day. For ten minutes, knock back every negative thought with a positive counter-thought. That’s it. You’re on the road to mastery of your own thought process. But you will find it’s not as easy as it sounds because there’s every probability that you’re trying to undo decades of ingrained behaviour. But let’s immediately counteract that negative statement with a positive one – namely that it takes just twenty-one days to ‘re-hypnotise’ yourself using positive affirmations. I use the term ‘re-hypnotise’ because every time you repeat a negative thought pattern, you are hypnotising yourself to fail. Consider how big business and many religious movements go about expanding their ranks. They hypnotise people using marketing techniques. But the difference between them and us is that they are motivated by money and control and we are motivated by our higher ideals. 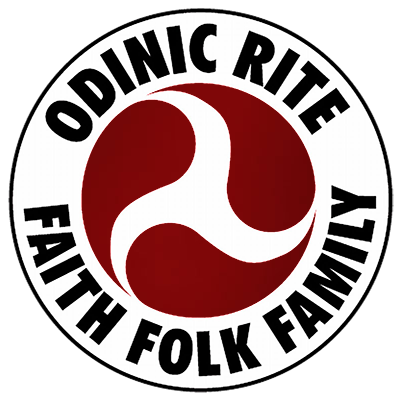 The Odinic Rite is an Order with a trusted hierarchy. We as members, Hearth Guardian’s, Hearth members and Hama’s are all a part of the OR and as such we all have a responsibility to be strong and healthy in mind, body and soul if our movement is to advance, the New Awakening is to be realised and our folk are to be restored to their natural position in Midgarth. This all starts with you and I and will reflect the efforts and sacrifices we are willing to make along the way towards achieving our vision. Join me as I continue my own battle against my inner voice; as I aim to conquer my negativities and as I aim to ‘Be All I Can Be’, to paraphrase a US military slogan. Begin immediately and knock back those negative comments, never letting one slip through the net. If a particularly strong negative thought comes your way, use visualisation techniques such as turning that bad thought into a huge meteorite and punching it into smithereens. That technique is particularly enjoyable and many more exotic ways can be imagined to turn it into a game you get to win every time. When knocking back your negative inner voice, it is important to always speak to yourself using positive affirmations. Do not say, “I am not afraid,” as this contains two negatives in the words ‘not’ and ‘afraid’. Instead, say, “I am confident I will succeed.” Over time, you will find it easier and easier to develop a positive inner dialogue and you will successfully program yourself for success. Another technique is to visualise yourself as a character in a movie, doing all the things you would love to be able to do. This person is your ‘God-self’; the person you can be when every negativity is defeated. About twelve years ago I had become so angry at myself and at my own ridiculous fears that I decided to do something to change my life for the better. I read a number of books and during some of my own early experimentation in positive thinking and self hypnosis I found something quite strange was happening. I began to find myself in situations which I had once feared, and although I recognised that I used to be afraid when such circumstances arose, the actual feeling of panic didn’t come anymore. As time went on I made bold decisions where once I would have shied away, and amongst other things I found and became involved with the Odinic Rite. As I continue my own journey, part of my plan is to create a downloadable track which can be used by myself and others for positive thinking and meditation exercises, and promote this track though OR Media. Thoughts on this would be welcome via the OR Media thread on the OR Forum. However advanced you are in your own Odinic journey, you will be able to take something from this article and use it to benefit yourself. Our ultimate goal is to be like our Gods, for they too have their own process of self improvement as anyone who has read our myths will agree. If Odin sought knowledge of his inner self, it is not a failure to admit that we all have things we can learn from and improve upon too. As Odinists we have set a foot on the path. If we don’t decide to follow it, we will fail, our movement will fail and our folk will never arise from their knees. Get stuck in, begin right now and make every effort to do as much as you can for the Rite, which includes improving and strengthening your inner resolve to ‘get the job done’. Remember, it is one thing to feel confident when in a comfortable situation but it’s another thing altogether to hold your nerve when hit by a bombshell. By strengthening our inner self through positive affirmations, we strengthen the Rite as a whole, for time and again we have all seen organisations collapse due to the failings of a few weak individuals. This will not be our wyrd! Hael Odin, who smashed through fear, doubt and pain to bring back the bight mead. Hael Odin’s children, who – like their father – have the inner ability to succeed. May we find our strength and use it wisely.